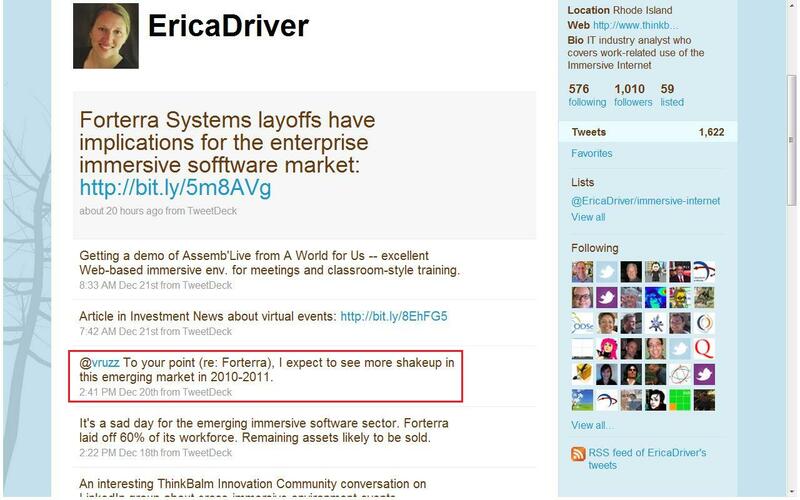 If Forterra Systems and Metaplace have sparked a virtual world industry shakeout, the question is: Who's next? So, unless you've been living in a virtual cave (and given our audience, that's actually a possibility), you probably heard the rumor this week that Forterra Systems laid off 60 percent of its staff, put its assets up for sale, and is shutting down. 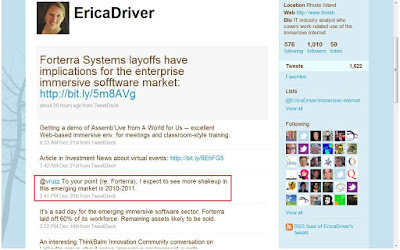 A day after ThinkBalm analyst Erica Driver broke the rumor on Twitter, Metaplace announced it was closing its doors. Driver has since verified that Forterra Systems has, indeed, conducted a massive layoff. Forterra burned through tens of millions in venture capital, yet could not achieve critical mass. Ditto Metaplace, which also burned through millions before folding. What in the virtual world is going on? Industry observers, including ThinkBalm's Driver, agree: The virtual world industry shakeout has begun. Driver tweeted, "I expect to see more shakeup in this emerging market in 2010-2011." In Karl Kapp and Tony O'Driscoll's new book, "Learning in 3D: Adding a New Dimension to Enterprise Learning and Collaboration," they describe 11 "3-D learning archetypes." These archetypes are what they consider the core ways organizations can use 3-D immersive environments for learning. Or in Karl's words, "These archetypes are some of the most effective methods of designing instruction to maximize the accordances of virtual spaces." We're creating a space inside of our public demo version of ProtoSphere to demonstrate these archetypes. Karl and Tony will also be using it as part their promotional efforts for their book. Last week, I shared with Karl some screen caps of the progress we're making. You can take a look at them below too. A new feature in ProtoSphere 1.4 is Active Directory integration. One of the core benefits of this is the ability to support single sign-on. Our developers have been hard at work at enabling this, and I wanted to share with you a sneak peak of the function in action. If you’re familiar with ProtoSphere, you’ll recall that every time you launch the application, a login box appears that prompts you to enter your username and password. Once the credentials are passed to the system and checked, you’re allowed entrance into the environment. With version 1.4 and single sign-on, however, we remove that process. You are already logged into your computer and company network. So when you launch ProtoSphere, it now checks Active Directory for your credentials, passes that information onto the ProtoSphere servers, and allows you to enter the environment. Now, you might be thinking, Well what’s the big deal if I have to type in my username and password one more time? The added benefit goes to the system administrators of an enterprise-wide roll-out. There’s no longer a need to maintain multiple sets of credentials -- not to mention the nightmare of having to enter potentially thousands of user accounts into a new system. 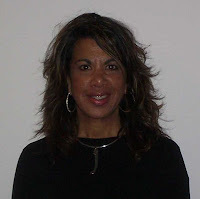 I wanted to share another tip from IBM's Jayne Nanavaty-Dahl about how to implement a successful remote worker strategy in your organization. Her recommendations are taken from lessons she's learned from implementing OTTO (Other Than Traditional Office), IBM's remote worker practice. Today's recommendation is manage workers by building personal relationships. Why 3-D? It supports private, personalized training and learning. Exploring the Why 3-D? question more ... I wanted to add that 3-D supports myriad interactive training methods that imitate real-world classroom instruction. In particular, it supports private, personalized training and learning. Meanwhile, 2-D screen share or Web conference limits you to just one training method of showing learners slides, pictures, etc. in a group setting. For instance, one of the features that many of our customers request in their ProtoSphere environments is the private VoIP zone. Certain areas within a zone are deemed to be private, usually defined by some sort of signage or visual cue, and contain a small table with a few chairs around it. Labels: 2-D environments, 3-D, Learning, Learning styles, Private VoIP zones, ProtoSphere, Training, Why 3-D? In Hinduism, Avatar or Avatara describes the descent of a deity from heaven to earth. 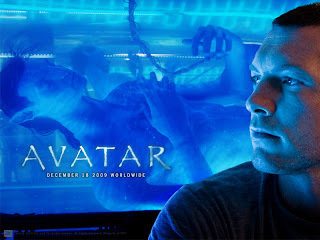 In English, we translate avatar to mean "incarnation," "appearance," or "manifestation." And for us computer nerds, we have known avatars as representations of ourselves or our alter egos. It could be in the form of a 3-D model, 2-D icon, or text construct as found in early online gaming. I think after this weekend, the word will be more broadly understood by the masses, as James Cameron's new movie, "Avatar", opened across the country. Being a CGI (computer-generated imagery) fan from jump street, I of course had to go day one. How was it? In a single word, stunning. Go see it in a properly equipped digital theater, with the funky 3-D glasses, and you will be "immersed." If you're in life sciences, I probably don't need to tell you that the industry is at a turning point. The jury is out on how it will recover from the global recession, and companies are under pressure to accelerate discovery, grow revenues, improve learning, and boost sales with a thin workforce. However, as we have featured here on the blog, top life sciences companies are using new-generation collaboration technology to address their business needs and stay ahead of this new competitive landscape. In our experience, we've seen our life sciences customers take innovative approaches to online learning, teaming, and collaboration. And these approaches have yielded significant results in the forms of increased knowledge retention, decreased travel time and costs, improved communications, and more. 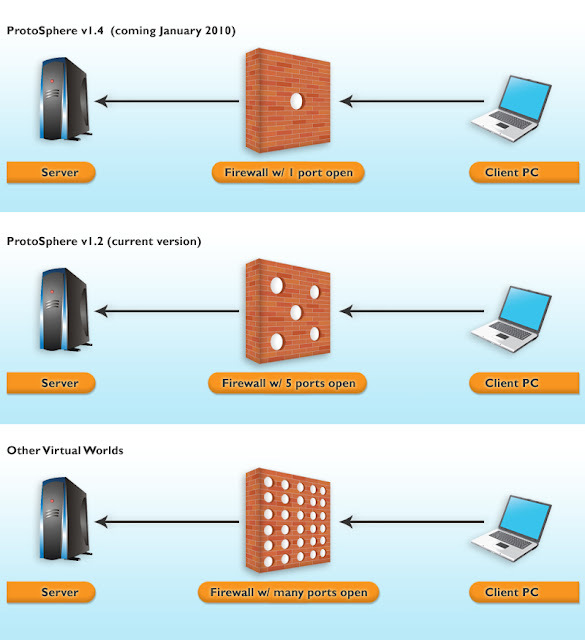 3-D virtual world products require companies to open numerous TCP/IP ports. This is how companies connect the virtual world platform to their network. ProtoSphere 1.4, however, will require just one port, port 80 or 443, to be opened. This is made possible through a technique known as NAT (network address translation) traversal. If you're not familiar with TCP/IP ports, think of a port like a door to a house. The house represents a firewall. Since the firewall is the tool that protects intellectual properties, computers, and servers, the more "doors" (ports) you keep open, the more vulnerable your data, digital assets, and servers are to security threats. We chose ports 80 and 443 for ProtoSphere v1.4 because most companies keep them open anyway. Customers can install ProtoSphere without bothering their IT department. All other 3-D virtual world platforms require companies to open multiple ports. One requires over 100 ports to be opened. I'm sure no IT manager would be happy about opening 100 ports. In fact, many IT managers will refuse to do so due to the security risks. I wanted to pick up where we left off with Jayne Nanavaty-Dahl's guest articles on IBM's OTTO (Other Than Traditional Office) initiative. Last week we shared her article on why IBM decided to implement OTTO. Since launching the initiative in 2007, Jayne has since learned several best practices for running it. Her recommendations are good tid-bits for other organizations interested in starting or improving their remote worker strategy, and we'll be sharing them with you here on the blog. Today we bring you the first one: Communication is key. Last week I had the chance to visit with one of our clients, a global energy firm, where I met with a new group of about 15-20 people. The firm is looking for justification for its unified communications and collaboration (UCC) strategy. In other words, why should it invest in UCC, and from whom? After three hours of material review, discussion, and Q&A, the essential feedback from the group was that they really liked ProtoSphere as a case study example to present to their line of business owners, because it illustrates a business application that would justify spending on implementation of the UCC infrastructure. They were positively inclined about the ability for the ProtoSphere environment to combine so many UCC elements, including IM/text chat, VoIP, presence, video, SharePoint document access, e-mail/calendar integration, conferencing, and social profiles. This would give end users the flexibility to select which one(s) would get the job done the best/fastest. They liked the concept of bringing the right people and the right real-time information feeds together, which could allow them to make optimal business decisions in the areas of manufacturing and production process management. This would add collaboration to those workflows. I came away from the meeting thinking, UCC: There's an app for that ... and it's called 3-D virtual environments. And specifically, in this situation, ProtoSphere. But also, is this experience indicative of a larger trend? Is collaboration in 3-D the way enterprises will justify their UCC investment? What are your thoughts? Social networking in the enterprise? Companies also looking to 3-D virtual worlds. C. W. Thompson put together his round-up of social networking technologies for the enterprise in a VentureBeat article last week. He listed several popular tools, such as SocialCast and Yammer, but he didn't touch upon what I think is the most exciting area of online collaboration -- you guessed it, 3-D virtual worlds. As I mention in the comment I left on C.W. 's article, the potential for enterprise 3-D virtual worlds is huge; so much so that developers of consumer virtual worlds, such as Linden Lab with Second Life, are now trying to figure out how to break in. Click over to C.W. 's article for the rest of his list and more of my thoughts in the comments. We learned about IBM's remote worker strategy last month when we interviewed Jayne Nanavaty-Dahl (right), Manager of Workforce Enablement Communications for IBM. The company calls its initiative OTTO, or Other Than Traditional Office, which Jayne started in 2007. We touched upon many facets of OTTO in our podcast, but if you're interested in more on IBM's strategy, Jayne has supplied us with a couple articles with more details. The first one is below, where she explains IBM's imperative for having a remote worker practice. Next time around, we'll share her recommendations for how to implement such a strategy. So stay tuned! In my day-to-day conversations with customers, analysts, partners, and peers, a common theme that comes up is, Why 3-D? Why are 3-D virtual environments better than 2-D environments for collaborating, meeting, teaming, and learning? What can 3-D offer that 2-D just cannot match? I find similar answers arising out of these conversations to explain the business advantages of 3-D virtual worlds. One of the primary ones is that 3-D enables interactivity that can lead to benefits such as higher retention rates, improved learning, increased collaboration, more productive brainstorming, and more efficient conflict resolution. 2-D Web conferences are mostly one way, or "half-duplex." Someone has the token, and they can talk and control the content. When someone else wants to interact, they get the token and then they talk or manipulate the document. While ProtoSphere has this mode of operation too -- in our app-share, for example -- general communications are interactive, or "full-duplex," and ad hoc, like gathering at the water cooler. Think of how much people learn in those water cooler conversations (though the office gossip might not always be so useful). Same idea holds true for learning. One-way learning consists of the instructor talking and leading learners through the material in the way she/he feels most appropriate. And we can do that in ProtoSphere too. However, the 3-D space lets users go through the material and learn in different ways (i.e., via exploration), depending on their learning style. This also contributes to the higher retention rates that we are seeing, such as those experienced by one global pharmaceutical company when it used ProtoSphere to build a 3-D social network to significantly improve its onboarding process for new MBA candidates. Interactivity also leads to the "social leveling" we see ProtoSphere users talking about. An example of this is when another pharmaceutical firm created the industry's first virtual poster session in ProtoSphere. Junior scientists approached senior ones, business people interacted with scientists, and employees of one generation engaged with newbies. All of this can eliminate silos and break down cultural barriers that often impede collaboration and productivity. At the same time, users are able to get a glimpse of the person’s background with a right-click on their avatar to see their social profile. The benefits of interactivity are also felt when it comes to brainstorming and conflict resolution. University of North Carolina researchers identified in a recent study two challenges when groups try to collaborate using video conferencing: Video conferencing is not the best environment for brainstorming, nor conflict resolution. Why? Because, as the researchers found, people can't interact easily, bounce ideas off one another, negotiate, and bargain. Video conferencing tends to fall under the token-passing phenomenon we see with 2-D Web meetings. 3-D environments, on the other hand, lend themselves to the collaboration necessary to brainstorm and solve problems efficiently and effectively. There are many other reasons we hear amidst our circles as to why 3-D environments have the advantage over 2-D environments. We'll continue to share them with you on the blog. And as always, feel free to share your ideas in the comments. Labels: 2-D environments, Brainstorming, Collaboration, Conflict resolution, Interactivity, Learning, Learning styles, Pharmaceuticals, Poster sessions, ProtoSphere, Retention, Social leveling, Why 3-D? You might have heard about some of the work that global consulting firm FutureWork Institute has done with 3-D virtual worlds. The organization focuses on addressing workplace issues of diversity and work/life balance, and helping companies develop ways all employees can make great contributions to the enterprise (what it refers to as "inclusion"). One approach that FutureWork Institute has taken is using 3-D virtual worlds to help organizations create flexible, inclusive work environments. President and CEO Margaret Regan created a video after hosting a Virtual Diversity and Inclusion Networking Event that covered the use of ProtoSphere, Unisfair, and Second Life for large-scale meetings and global conferences. Thought I'd share it with you all here.